Making a Character for a roleplay can be a difficult task. This guide is here to help you develop your own, well-rounded character. While characters, and their IDs, can differ from Roleplay to Roleplay, one thing is always the same. You are creating a person which you control in a role. However, you must always keep in mind that this is a rather subjective guide which may not suit your needs. Everyone has their own ways of doing things, but we hope that this guide will provide you with ways to add onto your style and improve on it. For the purposes of this guide, I will be creating a character as an example. When I come to creating a character, I usually like to include an image. This helps me further define the character. For the purposes of this guide, this is the image that I shall be using. Already I have a few defining qualities. Her species is human, for example. And she has long blonde hair and brown eyes. She is quite slender with an hourglass shape, and she appears to be fond of a Gothic design of clothes. This is a good framework from which to work. One of the first things I do is pick their name. This can be one of the most difficult stages of creating a character, as sometimes their name can have a lot to do with who they are, and I sometimes go through lists of names before finally finding one that I feel suits the character that I have in mind. Often, the name of a character will be determined by where they come from. Some names are more popular in some countries than in others. Not to mention that different countries have varied conventions of names. For example, Satoshi is a Japanese name, and Andrea is an English name. The two names have a very different style to them as well as differing popularities throughout the world. So, for the sake of argument, let us say that this character was born in America. More specifically, New York. Now that I know where she comes from, I can use Google to find the most common names in the New York area. There are several names such as Emily, Isabella, Olivia, Emma and Samantha. For this character, I am going to choose Olivia. Now, I have several pieces of information about her other than what I get from her image. Her name is Olivia, and she was born in New York, the United States. Now with that information, I can continue to further develop the character. This is where things become a lot more complicated. The next thing I like to do is develop a little history before I do anything else. The circumstances of her origin and background have a lot to do with how the character is at the time she is being roleplayed. She looks fairly young, so I would put her age to be roughly eighteen. In America, this is a good age for her to begin her stories at a University. And this is where I want to place her. Now, if I decide that she’s going to study a Scientific course, that would indicate that she is fairly intelligent. And this can have a huge impact with how she deals with situations, and how her personality is. Of course, she could be studying something such as English, or Psychology. Intelligence doesn’t play as large a role in either subject, especially compared to a Scientific field, but she may be more charismatic, or quite the extrovert. For the sake of this character ID, I am going to choose the first option. The budding little Scientist. Within this branch, there are numerous Scientific fields. Let us say that her ultimate goal is to become a Doctor, so she would be studying for a Medical degree. A Doctor is a good goal for her to aim for, but it requires a lot of hard work and dedication. It also means that she would have had to have strived towards good grades in her years spent at school. This desire to become a Doctor could have originated by a personal tragedy which acted as motivation for her. The death of a friend or family member, that instills a desire within her to make sure that whatever happened doesn’t happen to anyone else. Or, her natural compassion drew her towards that. For this character, I am going to go with the personal tragedy. And for this particular tragedy, I think it should be the death of her father, from a form of lung cancer that came about due to his very heavy smoking habits. Now that I have a rough idea as to her goals, desires and a little bit of background information, I can begin to develop her personality. It is clear that the death of her father affected her in a strong way. She was possibly very close to her father, as his existence in her life played a large role as to how it played out. This could indicate that she’s quite a compassionate and empathetic person. These personality traits could play well with her desire to be a Doctor. However it could have some very serious side effects. As a Doctor, she deals with individuals that are sick and injured, who need healing. But not everyone can be saved. Her compassionate and empathetic nature could lead her to be heavily affected by the patients that she loses. She might not quite learn how to distance herself from a patient so that she isn’t affected as much. This is a very good example of a situation where two good character traits become a character flaw, as these traits could cause her mental anguish further down the line. With the fact that she would have had to have studied hard to get to the University today, there are a few useful personality traits she could have. If she’s a hard worker, it’s a fair indication that she’s quite determined and focused. This would allow her to devote her time and energy into studying which improve her grades, and put her firmly in a place where she can go to whatever University she wishes to study. She might even be a little ambitious, and will stop at nothing until she reached her goal. It also stands to reason that she is quite Intelligent. This could lead into various other personality traits such as being rather philosophical, being focused, independant, perceptive, resourceful, and perhaps even introverted. This could make her the kind of person that doesn’t mind locking herself in her bedroom for hours at a time as she continues her studies. She doesn’t mind spending time with people, but she’s very comfortable with being alone for extended periods of time. This would be a very useful personality trait for her to have. However, like all humans. She has her flaws. And these can be represented within her personality. She could be very stubborn, and unwilling to listen to others even though they might be right. These traits, tied in with her compassion and empathy, could cause her to do things like persist in trying to heal a patient even though there is nothing anyone can do. She wouldn’t give up, and would continue even if they were dying right before her eyes. The personality of a character is one of the most crucial parts to develop, as their personality will determine how they should be portrayed. A kind and compassionate person would not hesitate to help someone, whereas someone who was callous may refuse to offer the same kind of help. Both of those individuals would react in a very different way to the exact same situation. But now I have several character traits for her; Intelligent, compassionate, empathetic, focused, perceptive and resourceful. When I write these down for the personality part of the character ID, I do it in such a way that I write down how those personality traits are expressed. Like the stubborn nature example above, that would be one of the ways that her personality manifests itself in her behaviour. The same with her compassion and empathy. With other traits, such as focused, it could manifest itself in various ways. She could be able to spend hours at a time, pouring over medical texts and journals. She could also become a little irritated when interrupted, as she wants to give all of her attention to what she is doing. There are many different personality combinations, and each combination can create an equally unique individual. To help with this, we have listed a few books below, at the bottom of the guide. Two of them deal specifically with personality traits, however the third one goes a little further afield and is good for getting information as to how various conditions and environmental conditions can affect a person, such as drug use, PTSD and even abuse. Once I have established the personality, I can then start thinking about certain likes and dislikes that the character has, as well as any hobbies and interests. With Olivia, as she is quite a compassionate individual, it is unlikely that she would have a hobby of going around kicking puppies and kittens. With her personality, it is very safe to assume that she has an interest in Medicine, and the art of healing others. She might also have interests relating to music and art, especially if either are able to help her focus. Some of her hobbies and interests may not even be related to her career choice. She may have a part of her that very much enjoys skateboarding as a way to have fun. Already she has an interest in Gothic Fashion. 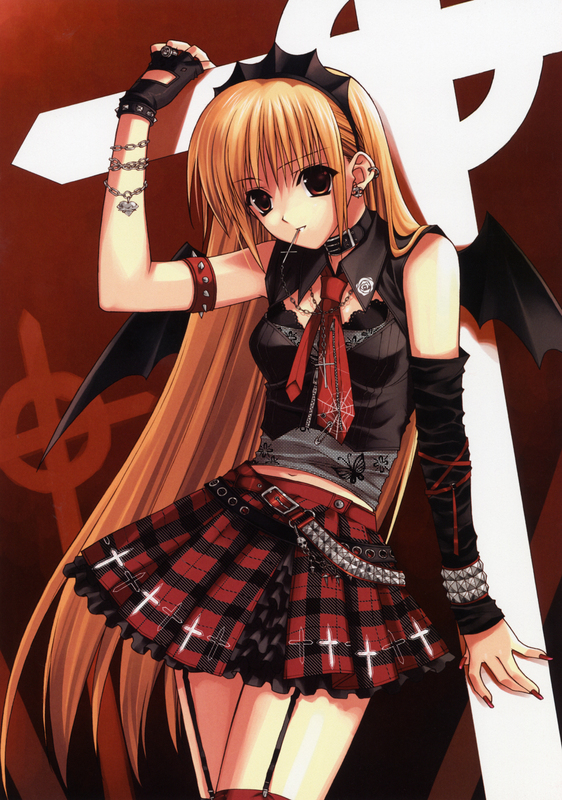 Not because she is Gothic, but because she likes the way the clothing looks. She may have even came up with her own style, with gothic only being a part of it. So she could be quite fashion conscious, and likes to look at recent fashions and talking about it to her friends. From there, I can extend that further by saying that not only does she like to look at fashion, but she also likes to design fashion. The clothing in her image could have been designed by her. This could lead to her liking to draw and sew her own clothing. Again, her personality may play a role in her dislikes. She might dislike hurting people, or getting people into trouble. As mentioned earlier, it is unlikely that she will have a hobby of kicking puppies and kittens. In fact, due to her compassionate nature, she could very well dislike people who would treat animals in such a manner. Again, there will be dislikes that seem to have little relation to her personality. She might be very afraid of spiders, for example, or have a distaste for insects or rats. She might even have a more obscure dislike, such as the feeling of raw cotton on her skin. Her hobbies and Interests, as well as her likes and dislikes, will have a play on how she likes to spend her free time. With her love for fashion she might like to spend her free hours designing and making clothes, or, when she wishes to be around her friends, she might go out somewhere so that they can skate together. Sometimes, a character will have some kind of ability. This is either because of some kind of plot device, or that is just how the character is. Abilities can be as benign as having an Internal Clock in their head, or be something very obvious such as being able to throw fireballs at others. One good source to look up various super-powers, is the Super Power Wiki <LINK>. It has thousands of abilities that you could either pick from, or you can use it as a guide as you create your own. Sometimes picking an ability for a character is hard, especially one that suits them. But for Olivia, I can imagine her having a rather passive ability; Empathy. Not only is she Empathetic personality-wise, but she also has a mild telepathic ability to sense the emotions of those around her. When writing up a Character ID, some people would just put down ‘Empathetic’ and leave it at that. But that doesn’t provide a whole lot of detail. It’s always best to write down the extent of this ability. For example, Olivia may only get a hint of what others are feeling. Or she might get a very strong sense. Or it could be dependant on the intensity of the emotion. The more intense the emotion, the more she can sense. She may also have limited range in which this works. It could be as small as a metre around her person, to ten metres. The next thing you need to think about when it comes to a character’s abilities, is their disadvantages or weaknesses. In Olivia’s case, if we go for the option where her empathic ability is a six metre field around her, and she can sense more the more intense the emotion, there are several weaknesses within that. For example, an emotion can be so intense for her that she cannot handle it, especially if it was a strong anger or hate. With being such a compassionate person, such emotions might not sit very well with her, and it might cause her to retreat if she does not know how to properly differentiate her own emotions from those she is sensing. Another disadvantage could be that she cannot use this ability with someone that she is talking over the phone with, or watching on television. So she wouldn’t be able to gauge the emotions of those over a long distance, even if she is speaking directly with them. Sometimes, the weaknesses of a character can be tied in with their personality. For example, with Olivia’s stubbornness, this can lead to situations that work against her, such as the example earlier where she could try and save a patient who has no chance of survival. This could affect her in a way that impacts her personal happiness, the relationships with others as well as her mental stability. When thinking about the skills of a character, several things should be taken into account. Their history, personality, goals, aspirations, and their hobbies and interests. Olivia, for example, would be skilled at designing, sewing and making clothes. She would also be good at being able to sit down and study for extended periods of time. She might also be good at cooking, which is something she possibly learnt from her parents. She might also already have several skills relating to her desired profession. It could be the case that she knows basic first aid such as CPR, or proper bandage application. With her interest in skateboarding, she could have been doing it long enough that she is rather skilled and is able to do any number of tricks. When it comes to deciding the strengths of a character, some people automatically think that this is tied in with their abilities, but most of the time it isn’t. The strengths can tie in with the abilities, skills and personality of the character. In Olivia’s case, the personality traits of being compassionate and empathetic can be one of her strengths. It could cause others to view her in a positive light, and they would defend her if another person attempted to attack her in some manner. These personality traits would also allow her to better help her patients, as she would know what they are feeling when she is close to them. This means she could tell if a patient was lying, or she could even pinpoint the exact location of pain. This could eventually lead to the patient being diagnosed and given the proper treatment. While I mentioned her stubbornness as a weakness, it can also work as a strength. It would allow her to start on something, and not easily give up. She would try and see it through to the end. This ties in nicely with her focused personality trait. She can remain focused on a task, and have the stubbornness not to give up, no matter how frustrating or hopeless it may seem. There are many ways that the personality, skills, and abilities can play into strengths. It’s best to look over what you have done so far with a character, and work out how certain aspects of the character can play in as a strength. This can also be done with weaknesses. When I come to this part of creating a character, I like to assign myself a list of questions for me to answer. Like with the empathy, I will ask myself questions such as; How much can she sense? How far can she sense? Can she sense pain? Does it cause her pain when emotions are too intense? What happens when emotions are too intense? Do the emotions she sense feel like her own emotions, as if she is expressing them herself? Sometimes that list can get quite long. However, I tend to find that it helps me sort out the ability in my mind and to be able to write down further detail. And with more detail on that ability, I can do more detail in the weaknesses as well as the strengths. The bio for a character can sometimes be the longest and most complicated parts of the process. Sometimes it’s even the hardest, especially if you don’t already have some ideas. At the moment, there are only a few things we know about Olivia and her past. We know that she originated from New York, and her father died due to lung cancer. It’s possible, of course, that she wasn’t actually born in New York. She could have been born somewhere else, but grew up in New York because her parents moved there. For Olivia, though, I am going to have it that she was born there. I don’t think her parents should be too rich, but they could make enough to make them a middle-class family. Her mother could be involved in a corporation while her father was perhaps in his own business. This would mean that Olivia was unlikely to have had any economic struggles. However, that doesn’t mean that her life was all sunshine and daisies. She’s a very compassionate person, so it’s possible that she could have been bullied while at school. Now, there are several ways that she as a character could have reacted to this. She could have ignored it, stood up to them or taken the bullying personally. Again this all comes down to her personality, as it will help dictate how she responded. In Olivia’s case, with her stubbornness mixed with how focused she is, she would most likely ignore it. To her it seems petty and she doesn’t satisfy them by raising to their bait. So while fellow students would have been mocking her, she would maintain a lofty disdain for their behaviour. She doesn’t like to hurt others, and it’s likely she doesn’t like it when other people hurt others. Sometimes doing the childhood of a character is quite hard. It’s so much easier to simply say ‘Her childhood was good’ and leave it at that. What you need to think about is what events in her childhood helped her become the person she is today? Were there any people in her life that influenced her? For Olivia, there is one person already that has had a clear influence over her. Her father. When young, it’s possible that she spent more time with him than she did her mother. It’s possible that she also spent time at his business helping him. While her mother was central in her life, she didn’t have as much of an impact on Olivia as her father. During her childhood, it’s likely that she had numerous friends. It’s often that friends from school might not keep in touch as the years go by. But with only being eighteen, Olivia most likely still has contact with her friends. For this character, I think a small group of good friends would suit her. Ones that would have likely stuck being friends all throughout her school life. It’s possible that they often went places with one another, and it was these friends that brought about Olivia’s fascination with fashion. Now we come to one of the more important events in her life, so to speak. The death of her father and the aftermath of it. In Olivia’s case, her father could have been diagnosed when she was fourteen. She had to watch the deterioration of her father, which would have had a devastating effect on her. It’s possible that her grades began to fail and she often didn’t sleep well. It’s possible that her friends would have done everything they could to help her through this difficult time in her life. After her father’s death, she would have been stricken with grief. This is the point in her life that she decided that she wanted to become a Doctor. Her father had died when she was young, and she wanted to try her best to prevent that from happening to anyone else. Once she had reached that decision, she would have buckled down with her school work and studied hard. She would have went on to apply to a medical University which she was accepted into. This would be the point where I would end the bio, as this is the point where I am actually roleplaying the character. It’s best to note down important events in a character's life down in a list and then use that list to expand upon in the bio. Some of the events in her life would require more attention than others, such as the death of her father. The bio of a character is an outline of the events that brought your character to the point where they are today. Some events have more sway on the character than others, but the end result is the same. Think of the bio as a short story; a tale of your character. The more you write in the bio, the more information you are giving about your character, and the more in-depth they will be. Now we come to additional information. This isn’t really anything that’s required, however it can help add more depth to the character. For example; their criminal record. If they have had a seedy and interesting past, then you can expect a few things to be on there. In Olivia’s case, she would be the kind of person that would avoid doing anything that would cause her to get into trouble with the law. Another thing you could add in is the medical record of the character, especially if their health has played a large role in their bio. For Olivia, it would make logical sense that she would have broken more than a few bones, due to her hobby of skateboarding. Those are the two largest examples of additional information, however it doesn’t really have to stop there. You could add information as to how they’re a smoker, or that they have a pet, or that they are a user of drugs. Any number of these things can have an influence on the character and how you roleplay them. It can be hard to create a good, well rounded character, especially if that character is complicated. The easiest way to do it would be through a step by step process. Remember that parts of your character are linked to other parts of the ID, such as their personality being linked to their history and for some, their medical history. Sometimes, you might end up with a rather bare boned Character ID, but don’t fret. Sometimes, that character can be further developed as you roleplay them. They become more broad and more in-depth as you play out some of the events in their life. Just don’t forget to add them to your Character ID. Sometimes, especially with long complicated plots, you can lose some of the development you made due to forgetting about them. We are not paid, nor are we commissioned /Affiliated and we have no connection, affiliate or otherwise to them. The Negative Trait Thesaurus: A Writer's Guide to Character Flaws by Angela Ackerman and Becca Puglisi. The Positive Trait Thesaurus: A Writer's Guide to Character Attributes by Angela Ackerman and Becca Puglisi.